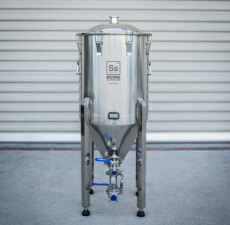 A stainless steel conical fermenter for under $500? You read that right! 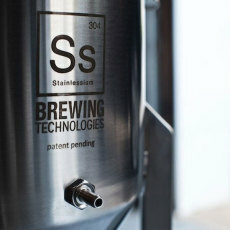 The Chronical from SS Brewtech is here! 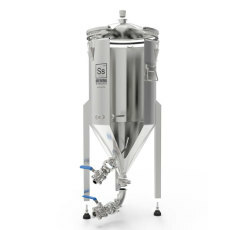 This 14 gallon capacity (13 in fermenter body + 1 gallon head space in lid) conical fermenter is made of certified food grade 304 stainless steel for clean and sanitary fermentation of all your beer. This fermenter also comes with a 1/2 in. racking ball valve assembly for easy racking from the Chronical, and a 3/4 in. dump ball valve for dumping trub and yeast collection, all with 1.5 in. tri-clamp fittings! These fittings go on sanitary welds on the Chronical body, which has etched markings in both gallons and liters on the interior. 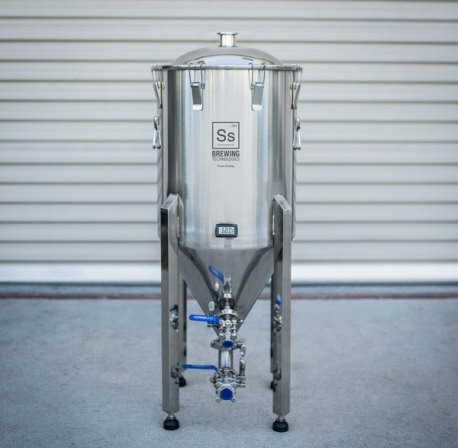 The gasketed lid creates the perfect seal on the top of the fermenter, and can utilize an airlock or an option tri-clamp barbed fitting for blowoff (sold separately). 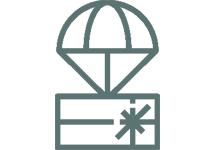 A thermowell assembly is also included for temperature readings (thermometer sold separately). 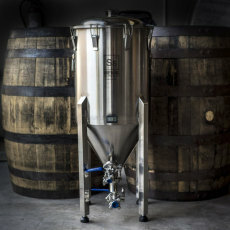 Handles on the side of the fermenter are convenient for moving the fermenter around when empty. You can't beat the price for all these options and features! PLEASE NOTE: These are stock photos of the standard Chronical from our supplier. The pictured digital thermometer is NOT included with the standard model Chronical Fermenters. Tri-clamp fittings for bottom dump, racking valve, and lid. Gasketed lid for incredible seal!